CaptureExec is a very innovative product that is completely user customizable to our specific company needs. Most impressed with the ability to create customized Template designs that can be used for Gate reviews, Kick off meetings, etc. Basically any company document can be converted to an .xml template to capture any specific data from Capture Executive database. In promoting a One time entry BD environment, this is especially helpful with utilizing data entered by BD Leads and Capture Managers to be put to use in other company documents/presentations by using the Capture Executive Template system. Also worthy of high praise is Progress tracking feature, customized reporting capabilities, Quota management, and Overview of all Capture information on the Executive level. Very pleased so far with the capabilities of this dynamic and user customizable CRM tool. As I came onboard Advanced Onion, one of the things that really bothered me was our adhoc opportunity management process, and constant ’surprise’ at things that were getting dropped through the cracks. We had no effective opportunity management process, which made opportunity management, PWin scoring, teams, and every aspect much more difficult and reliant on emails and memory. And worse, I had a really tough time understanding the true strength of the pipeline. 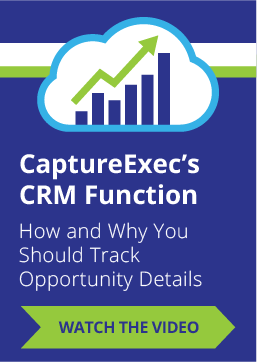 I researched the market and it came down to SalesForce and CaptureExec. SF was expensive and difficult, so we implemented CaptureExec in December and it’s been fantastic! The systems does everything that we wanted and more, and is extremely easy to use and manage, and it’s relatively inexpensive. Anyhow, Skip Blackburn is extremely knowledgeable on the GovCon capture processes and can really advise on best practices as well. Regardless, we couldn’t be happier with our implementation process (2 days), training (2 days), and subsequent usage of CaptureExec. We enter all opportunities in it, use it for Opportunity, PWin and Progress Scoring, keep all activity notes, upload all relevant documents (including NDAs, TAs, etc. ), run our Gate Review process, do our Pipeline Review meetings in it, and at the executive level we are much more aware of the strength of our pipeline, etc.